If you’re in need of an electric panel installation, you might be wondering if you can do it on your own. Even if you’re a handy kind of person, handling it on your own is not a good idea. In fact, many cities have a rule in place that prevents any non-professionals from performing this kind of installation. Beyond the complicated nature of putting in a new electrical panel, the task can be dangerous. This is in addition to the long-term hazards that might arise from incorrect electric panel installation. You could be putting your home at risk of a fire, in addition to exposing yourself to the possibility of electrocution. Why Would I Need a New Electrical Panel Installed in the First Place? ● Your current panel shows signs of rust or damage, meaning it could already be deteriorating and become a safety risk. ● Your circuit breakers are tripping more frequently than before. ● You’re experiencing less power going to your lights and wall outlets. ● Your power keeps going out due to system overload. ● You’ve had appliances get damaged or even completely ruined as a result of electrical problems. What Goes Into an Electric Panel Installation? 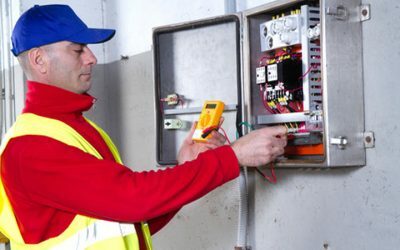 A reliable professional will take steps to ensure your new panel is set up to last a long time. High-quality equipment, including the panels and circuit breakers, will be less likely to fail, and the electrician will make sure the installation meets code requirements. Staying within the required electrical code will keep your house and everything in it safe from issues down the road. In addition, the electrician will test your panels to confirm correct setup and will check the panel’s wiring to make sure there is no possibility of overloads. This can be a very involved process, and even the smallest mistake or overlooked flaw could spell disaster for your system and your safety. Where Do I Go for an Electric Panel Installation? Sometimes old panels don’t function well with newer technology. Other times they simply stop working the way they’re supposed to or develop dangerous malfunctions. Regardless of why you need a new electrical panel installation, getting an upgrade isn’t something you should try to do alone. Qualified, experienced professionals can get the job done safely and efficiently; so, you don’t need to waste time worrying about it. If you’re looking for advice or help with your new electric panel installation, contact the expert electricians at Bryan Electric, Inc. today. Visit us online or call us at (770) 680-2144 if you have questions, or if you’d like to schedule an evaluation of your system.